The annual National Bike Summit in Washington, D.C. this month presented a key opportunity for bicycle safety advocates to press Congressional leaders on the importance of investing in bicycle infrastructure and continued efforts to unify local, regional and national forces in furthering bike-related projects and programs. Boston bike attorney Andrew Fischer was present and actively involved with a group of MASSBIKE representatives. The three-day conference concluded with a full day of lobbying. 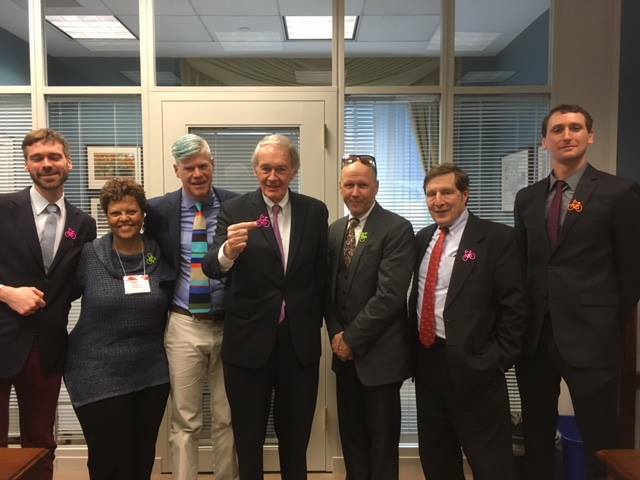 In addition to meeting with Sen. Ed Markey (D-Mass), Fischer and the team met with the staffers of Elizabeth Warren and Reps. Joe Kennedy III, Seth Moulton, Michael Capuano and James McGovern. Primary goals included outlining critical concerns of the cycling community and advocating for peak priority in larger urban planning actions. At the time of the conference, the first week in March, federal funding for bike infrastructure appeared threatened, as part of the budget cuts for mass transit and transportation funding for big cities, particularly in the northeast and on the costs. We though we would need to work with our allies in the Massachusetts delegation to protect this funding, which remains essential in the fight to continue our campaign for safer streets in Boston and throughout the Commonwealth. However, bicycle infrastructure funding was included in the budget that passed two weeks after our return from Washington. This allows us to continue to advocate for improved bicycle infrastructure. The National Bike Summit is an annual event organized by The American League of Bicyclists with the goal of unifying and educating bike safety partners and connecting with influential leaders to spur effective change. Reduced traffic deaths and injuries, which means less burden on state and local emergency services and health care systems. One of our main goals while in D.C. was to convince leaders that road safety absolutely must be a top priority. We lost 40,000 people in traffic crashes in the U.S. last year alone. We’re dying at twice the rate of Canadians per capita and four times the rate of those in the U.K. We have the ability to change that. To do so, we need to invest in infrastructure projects that introduce traffic calming measures and promote complete streets that incorporate the needs of all road users – including bicyclists, who are far too often overlooked in these discussions. The increasing number of independent dockless bike share services in areas outside of Boston proper was initially a cause of concern raised in an earlier blog posted January 28, 2018. We worried these businesses would undercut the success of the Hubway program in the metropolitan Boston/ Cambridge area. We discussed the potential for a “bike share war,” and noted that it could slash incentive for the city to continue investing in expansion of its current bike share program. Because these dockless bike share programs rely heavily on GPS tracking to keep tabs on the bikes, a lot of data can now be gleaned about where these bikes are going, who is using them and how they are being used. A few interesting things have been discovered. Many of these bikes were initially released into college towns and gentrified neighborhoods. But they didn’t always stay there (because they weren’t tethered to docking stations in those communities). This allows us to see who is going to or from schools, hospitals, government buildings or commercial areas – information not available bike counts, which were the only way to track bicycle use before GPS on bike share bikes. Many of these new dockless bikes ended up drifting to lower income areas, which haven’t received near enough attention. As it turned out, people are primarily using them to get to-and-from work, often by getting to or from mass transit stations. It creates a greater connectivity for people who don’t have a car, walking 20 minutes in the cold to get to a train station and for people without cars who live beyond walking distance from mass transit. Plus, users are not restricted to the limited number of docking stations. Because access and tracking of the bikes are managed through smartphone apps instead of brick-and-mortar stations, more people can pick up or drop off these bikes anywhere. People in gateway communities like Springfield, Lowell and New Bedford now have a better way to commute. That’s an improvement not just for health and the environment, but to our economy. This creates a whole new way to build intermodal infrastructure that doesn’t require enormous costs and is affordable for those in working class neighborhoods. Originally, we thought these dockless bike share companies were renegade operations that would undermine Hubway. The revelation from the Bike Summit about GPS tracking of dockless bikes has completely changed our thinking. This is capitalism at work- the way it should be working. This is something that will be increasingly important as cycling in Massachusetts becomes more popular. The City of Boston recently released its Boston Bicycle Counts for 2017, revealing what our bicycle attorneys already know: Biking is growing fast. An estimated 40,000 bike trips were made at 62 locations every single day in the city. Bear in mind: This doesn’t even capture all the trips made in the city, but rather gives us a representative number. These figures provide important insight not only about the fact that the number of cyclists are growing, but also how we’re growing. This data will be essential moving forward as we continue to help map out the best plans for future bicycle infrastructure in Massachusetts.